In this MPC Renaissance review, I specifically concentrate on the MPC Renaissance hardware itself, including a look at build quality, design, features and improvements over previous flagship MPCs. Upon lifting the MPC Renaissance out of its box, the first impression is that it is a solid, well weighted machine. Everything seems to have been built tightly and well put together, and there’s no creaks or loose sections. The top and bottom casing are made of metal, while the grey sides are a svelte matt rigid plastic. Generally speaking, the MPC Renaissance certainly has a well built, quality feel about it. The MPC Renaissance is pretty much the same width as an MPC5000, but with the smaller depth of an MPC2500. What makes the Ren very different to previous ‘flagship’ MPCs is that it has a much lower profile, and this helps it move away from the more traditional ‘box-like’ quality that some MPCs possess. The MPC Renaissance weighs just under 5kg but due in part to that lower profile and the design of the side panels, which have a ridge for your fingers to sit under, the MPC Renaissance can be carried around with a lot less effort than the weight may suggest. However, I don’t think many people are buying the MPC Renaissance with portability in mind; make no mistake, lugging it around in a bag or backpack for extended periods isn’t going to be ideal but for the occasional gig or transport to another studio, it’s not going to represent any type of ordeal. 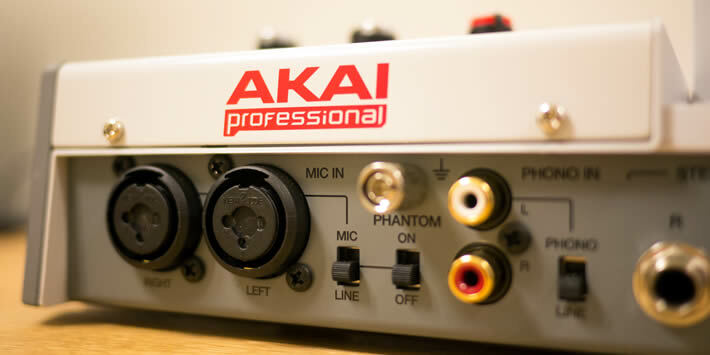 Of course if you need portability on a regular basis, Akai are clearly hoping you’ll show an eager interest in the forthcoming MPC Studio. The design of the MPC Renaissance is clearly heavily inspired by the classic Roger Linn MPC3000, certainly in terms of the overall colour scheme, the palm rest and most definitely in terms of the transport buttons (more about those later). This may be seen as a bit controversial given Roger’s recent comments about his royalty payments, but by all accounts, this was a user requested feature. Putting all that to one side, the design as a whole is clean and pleasing and is most definitely a big improvement over the somewhat functional design of the MPC5000. But the entire product design as a whole is really just ‘standard MPC’ with an MPC3000 skin and no real surprises (other than the abundance of flashing LEDs everywhere). Don’t get me wrong, it’s pleasant enough and looks good in the studio, but it’s not cutting-edge product design, and I for one would like to see more innovation in this aspect of the MPC line. If the classic MPC3000 look isn’t for you, MPC Stuff have already made some MPC Renaissance skins in a variety of colours – including brushed chrome and even a black MPC3000 LE design. Another legacy MPC-inspired addition to the Ren is the palm rest. I assume this is plastic but with a leather look and feel. It’s firm with a slight spongy feel and is a nice touch which will give your hands a bit of extra comfort. The arm rest on my unit is a slightly dark grey, but there appears to be some units fitted with a black arm rest. The MPC Renaissance, like all MPCs before it, has the majority of connections at the back of the unit. There’s no surprises here, and if you own an MPC5000 most of this will look very familiar. For recording, you get two balanced 1/4 XLR inputs that can be used for line and mic levels (line level is adjusted using switches on the top of the unit), plus dedicated RCA inputs for phono level recordings direct from turntables (grounding screw included). Also included is a phantom power switch for condensor mic recording, and a SPDIF digital in/out. For audio out, there’s a total of four analogue ports which use the Ren’s built in audio interface to output the sounds from your MPC Software – ports 1 and 2 are the ‘main outputs’ and 3 and 4 are the assignable mix outputs (‘individual outs’ as most MPC users would call them). From within the MPC Software you can choose which sounds are sent to which specific output using the program mixer. These outputs are able to receive the full ‘Vintage Mode’ treatment, a combination of software and hardware emulation of the classic sounds of MPC3000, MPC60 and also SP1200. I’m finding it hard to pin down exactly how Vintage Mode works and there’s no detailed explanation in the MPC manual, so really we only have Akai’s marketing machine for the scant information on this process, which apparently uses actual circuitry design from the MPC3000 in combination with software algorithms. I’d prefer to spend more time with Vintage Mode before commenting in detail, so I’ll create a separate review for this feature as soon as I can. Traditionally a flagship MPC has a total of ten outputs and these are used to ‘track’ your MPC sequences as individual audio tracks to a mixer, DAW or other form of hard disk recorder, allowing you to quickly transfer your MPC beats into audio format while taking advantage of external processors, effects or the desired sound of hi end desks etc. With only four analogue outputs, the Ren is clearly at a disadvantage in this respect. However it may be argued that with the move to a more computer-centric operation, most of your tracking will be done simply by a digital render within the MPC software. It can also be pointed out that you are still free to use a third party audio interface (configurable from within the MPC Software), which could have as many outputs as you can afford. However both these solutions mean you are not able to take full advantage of Vintage Mode, as you can only access the software element of Vintage Mode when working outside of the Ren audio interface. So either way, it’s worth bearing this in mind if you intend to utilize ten or so outputs from your MPC on a regular basis, especially if you dream of drenching all your individual tracks in full hardware assisted Vintage Mode. But again, this really depends if the ‘hardware’ element of Vintage Mode lives up to the hype – the feedback on MPC-Forums so far has been fairly subdued. Finally on the front of the machine are two 1/4 inch footswitch ports and two headphone jacks – one for a 2.5mm connector, one for a 3.5mm. There’s also a mix control to adjust the mix of MAIN OUT (audio outputs 1 & 2) signal and the ‘individual outs’ signal (audio outputs 3 and 4). In terms of computer connectivity, everything is handled by the orange USB port at the back of the unit; a standard length USB cable is included, but you should be able to use any decent quality USB cable for this connection. This USB connection is what is used for all communication between the Ren and your computer and must remain connected at all times otherwise the MPC Software will only function correctly. So far I’ve found that everything works a lot better if the Ren is connected directly to a primary USB port on your computer, and not via a USB hub (even a powered one). Going through my hub led to a few communication problems which required rebooting both the MPC Software and the Ren. This could however be a power issue with my hub. To compensate the loss of a USB port in your computer, the back of the Renaissance also features a two port USB hub – so far I’ve connected a 2.5″ portable USB drive into one of these ports and my computer recognised it straight away. It’s something I’ll test more over time, but so far, there’s definitely no obvious power issues here, that drive was working fine. Unfortunately the entire USB interface uses USB 2.0 rather than the now mature USB 3.0 standard. I’m not sure if this is purely a cost cutting exercise or a limitation of the hardware driver being used to handle the computer connectivity. This however is a common trait with the MPC line, for example the MPC1000 used USB 1.1 when USB 2.0 was the most current tech. Like the MPC500, the MPC Renaissance runs off an external PSU instead of the usual kettle lead. This is a two part unit consisting of the PSU itself and a detachable two pin lead with the plug on the end. Be aware that the PSU that ships with the Ren is only approximately 4 feet long, so if you need something a little longer you’ll need to either use an extension cable or purchase an extended length PSU kit from MPC Stuff or other electrical suppliers (make sure you get the correct PSU rating of 12V DC, 2A, center pin positive). A handy addition is the power cord restraint, which you twist your power cable around to help prevent it being accidentally yanked out. In my opinion, MPC data wheels have always been a blot in Numark’s copybook, they’ve either been a bit wobbly and loose, like the MPC1000 and MPC500, or very noisy like the MPC2500. I’m happy to report that the data wheel on the MPC Renaissance is very nice indeed, it’s sturdy, no major wobble and it generally feels good under the fingers. The only minor gripe is that there’s also no small round indentation to allow easy one-finger scrolling, but this is is not a big deal in general usage as some of the usual data wheel-heavy jobs are going to be performed in your computer or via Q Links. Thankfully this data wheel is very quiet; just a very soft, muffled click that’s barely noticeable. So if you’re doing late night work at home, no one is going to be woken by your data wheel (which was definitely not the case with an MPC2500). If you’re new to the MPC and don’t know what Q Links are, they are assignable knobs that simply let you control MPC Software parameters in real time, such as filter sweeps, tuning changes, sample edits, mixer settings etc. 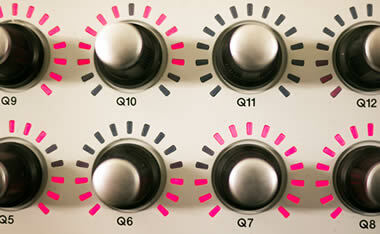 There’s 16 Q Link dials on the MPC Renaissance and the motion is smooth and easy. In operation the dials simply pick up from where the current parameter setting is in the software. So if Q4 is assigned to the ‘tuning’ parameter in the software, and the software tuning value is set to 87, turning the Q4 dial to the left takes the value from 87 downwards. There are no clicks or graduations on the Q Link dials, and no ‘zero’ indicator. Motion is smooth and there’s just enough resistance to give a nice confident feel to the control. The dials themselves look similar to the dials used on previous MPCs (minus a zero marker), but this time they have silver painted tops, which I feel look a bit cheap – a polished metal top would have been preferable. However this painted top may have been a technical requirement to allow a rather cool feature of these Q Links – touch sensitivity. This is a feature Akai have kept pretty quiet about, but basically there are a number of little tricks you can do with this, such as muting tracks or triggering MIDI notes in DAWs, but I’ll look at this when I review the software. Each Q Link dial is surrounded by LEDs which light up in succession as you turn the dials – this seems somewhat gimmicky, but nevertheless adds some extra sparkle to a live performance. An obvious omission are Q Link sliders – the slider is just as much a recognisable feature of legacy MPCs as the pads and data wheel, so this omission is something I’m somewhat bemused by, especially as this is not something they can add later via a software update! I think certain Q Link tasks are better suited to a slider, such as MPC-style scratching, but I appreciate that this is somewhat of a niche use of the MPC, and for most tasks you’ll probably prefer the dial – or at least learn to adapt your technique pretty quickly. There are a vast array of buttons on the top face of the MPC – previous MPC owners will recognise the majority of them and will soon find that most of the additional buttons are simply dedicated to switching to different software screens – basically the ‘MODE & pad’ method has been dropped. People new to the MPC may find all these buttons somewhat intimidating, but really there’s nothing to worry about and you’ll soon be whizzing around like an expert. In terms of the hardware used for the buttons, many have been upgraded compared to previous MPCs. 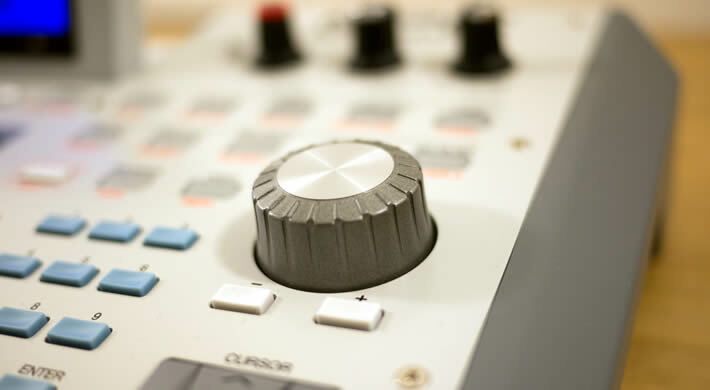 For example the transport controls (PLAY, REC etc) are now sturdy, low profile buttons with no wobble – in fact they are identical in looks to the ones used on the MPC3000. This type of low profile button is now used on the note repeat, erase and tap tempo buttons, and even to some degree on the ‘cursor’ buttons. Function and numeric buttons are also low profile, but with a concave dip – I’m not so sure that the dip provides any real benefit, and I would have preferred a flat finish, perhaps because my fingers are fairly large and these dips feel a little uncomfortable. Other than that, all the other buttons are pretty much the standard MPC fair, and are in the mould of the traditional ‘PAD BANK’ buttons which illuminate when pressed. Now, if you’ve used a previous Numark era MPC, you may have experienced the ‘dead button’ syndrome, where a button requires progressively harder presses until it finally just stops working. This was actually the result of the underlying electronic tact switch failing, and it’s been suggested that the tacts used in those older MPCs were fairly low quality. So what about the MPC Renaissance? Well I’m not quite ready to strip it down to check if the tacts are the same, so only time will tell if they’ve invested a few extra pennies on some decent tact switches this time round – but if anyone out there fancies opening up the Ren to find out, send me the details and I’ll update this review with your findings. In terms of quantity and function, there are buttons to control all the major features in the software, either as a dedicated button or accessed via the SHIFT key on the Ren. So for example program banks A – D have dedicated buttons, while bank E is accessed by holding down SHIFT and pressing the bank A button. FULL LEVEL also has a HALF LEVEL option via the SHIFT key. There’s dedicated F keys to control functions on the Ren’s screen, just like a legacy MPC. Vintage Mode also gets its own dedicated button to allow emulation of either MPC60, MPC3000 or the SP1200. No one wants an MPC with nasty pads (ask most original blue MPC1000 owners), and quite frankly you should rightly expect the pads to be top of the list of features to get 100% spot on. Well thankfully the pads are absolutely fine – responsive and accurate with a nice easy feel – finger drummers have nothing to worry about whatsoever, and the pad sensitivity can be fine tuned through the software so you can tweak and tweak until you are 100% happy. 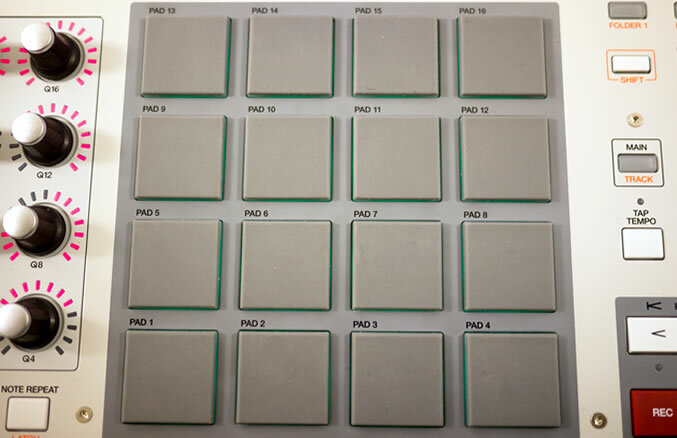 I suspect that the general pad and sensor design has been lifted directly from the MPC5000, with one obvious change – they light up around the edges. This is achieved by using transparent rubber for the pads while the top 2mm of each pad is opaque grey. By default, the lights indicate how hard you are hitting the pads, so you’ll have to decide whether that’s something you’ll benefit from having active as it can be turned off via the software. Some will see this as a gimmick, some will clearly see the benefits for live performances – it can certainly look pretty cool in the dark, but ultimately it’s currently just eye candy. However perhaps a more useful feature is that can also assign a specific colour to each pad (red, orange, green or yellow), which could be used to indicate a certain sample type (e.g. red=bass, yellow=drums etc). One thing to point out is that in MPC Software v1.1, rapid hitting of the pads results in approximately 1 in 6 of those hits not lighting up (equally, the pads on the software itself are also exhibiting this issue). This seems to be a software bug as v1.0 didn’t have this problem, so hopefully this can be easily fixed. This is not affecting the actual sample playback though, it seems purely a visual anomaly. The MPC Renaissance screen is housed in a hard plastic tilting casing; the housing feels sturdy with no creaks, and can be titled to approximately 80 degrees from the horizontal and also laid perfectly flat. The motion is smooth rather than the clicking increments you get on older MPCs and there is enough resistance to ensure the screen stays at the angle you want. The screen itself is a bright blue LCD display that uses the smaller font size you see in JJOSXL. The resolution of the screen is 360 x 96, which is a 50% increase compared to the 240 x 64 LCD used on the MPC2500/1000. Out of the box, the contrast was set perfectly for me, but you can adjust the screen contrast to taste within the software (hold down SHIFT and turn the data wheel). There is no way to adjust the brightness of the back light, but in my opinion this doesn’t need any adjustment, it’s perfectly fine for all situations. The display is crisp, and easy to read even when standing. The only issue for me is that this LCD exhibits a slight visual ‘fade’ when you move from one screen to another. When I first saw this I was disappointed as I prefer an instantaneous change like it is on an MPC2500, but to be perfectly honest I’ve now got used to this – however, unless this is a hardware limitation, it would be nice to be able to turn this off in the software. I’ve seen people refer to this as ‘lag’, but in all fairness there is no actual lag – press a button to change screen and the screen change begins immediately. But the change itself is done with a fading transition. There’s also a matching wooden palm rest. MPC Stuff tell me that on the way are thick pads (which I assume will illuminate), coloured standard size pads, coloured palm rests and black button sets. In addition to these there are a number of other parts and accessories available that are compatible with the Ren.I will keep my eye out for other MPC Renaissance add-ons – if you see any, please let me know in the comments. The MPC Renaissance hardware is definitely well made with a good solid, creak-free build quality. There’s welcome improvements to the MPC data wheel and buttons, the pads are excellent and excepting the love-hate fade transitions, the screen is crisp, bright and clear. Other than that, everything is generally ‘as expected’ of a hardware MPC. I would have liked to have seen the inclusion of at least one trusty Q link slider, even if this was at the expense of a column of Q Link dials, and I suspect the lack of analogue outputs will disappoint some. As always, I’m bemused by Akai’s use of clearly outdated tech such as USB 2.0 in a world where USB 3.0 is starting to show its age . But as a whole, the MPC Renaissance seems fine to perform the job it was built for – to control the new MPC Software, and it’s this software that quite rightly is getting most of the attention. But taking a step back from the whole ‘Maschine-esque’ model Akai have now adopted, how far has Akai brought the hardware aspect of the MPC since the previous flagship, the MPC5000? Can the hardware on its own be referred to as ‘revolutionary’? Well, features such as the touch sensitive Q Links, illuminated pads and the hardware/software based Vintage Mode are clearly ‘evolutionary‘ but you’d be struggling to refer to these additions on their own as ‘game changing’ or truly innovative – in my opinion these are welcome but ultimately incremental improvements and tweaks to the core MPC blueprint. To be fair, clearly Akai’s main focus has been the software, and I suspect this will continue to be their main focus for some time. I assume the main goal when building the Ren hardware was to create something functional, reliable and fit for purpose, and the most cost effective way to do this was to use tried and trusted features from the previous MPCs. 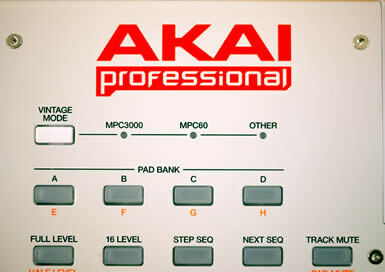 And if truth be told, I think most of us would rather Akai put most of their resources into ensuring the MPC Software was stable and well-featured from the get-go rather than try to simulataneously juggle a huge software project and a groundbreaking piece of hardware. But how long can the ‘tried and trusted’ MPC hardware survive in a rapidly changing market with ever-increasing competition from the likes of Native Instruments? Software innovation is important, but as technology moves on, surely there’s plenty of room for workflow improvements made directly from the hardware itself? With the iPad powered MPC Fly on its way, I can’t help but wonder how much hardware MPC workflow could be transformed by the introduction of a built in touch screen, with for example pinch and zoom sample editing and replacement of the traditional button pushing in favour of multitouch gestures. I can’t be the only person who wonders what an MPC would look like if some of the Apple product designers got their hands on it. But in the meantime, the MPC Renaissance hardware certainly seems capable of handling the duties required of it. In my next MPC Renaissance review I’m going to take a look at the main features of the MPC software (both on the computer and the firmware OS within the hardware), but most importantly I’m going to make a detailed assessment as to how the shift to a software-controller model has impacted the classic MPC workflow. 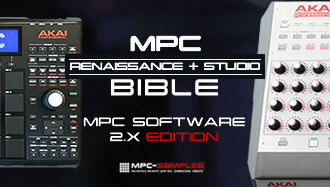 If you are looking for MPC Renaissance and MPC Studio tutorials, I’ve written two books packed out with tutorials, tricks and essential shortcuts for the MPC Software; ‘The MPC Renaissance & MPC Studio Bible (for MPC Software 2.x), and ‘MPC Renaissance & MPC Studio: Sampling Laid Bare‘ (for MPC Software 1.9.6). Fixed a couple of errors regarding weight and pad illumination. The MPC Renaissance is just a dedicated controller for the MPC Software, so it has to be connected to a computer/laptop at all times. The Ren itself has no onboard storage and is not a standalone MPC. Please verify whether or not the mpc ren can successfully be slaved to a hardware sequencer, like an mpc-1000, or if the mpc ren can act as the master clock for another hardware based (midi 5 pin) sequencer….thanks for checking out the build qualities. But there are no reports about whether syncing with a hardware sequencer is possible. You said there is two in , four out midi. ….i am sorry to make a fuss…..but there is a great deal that you could say in your review. 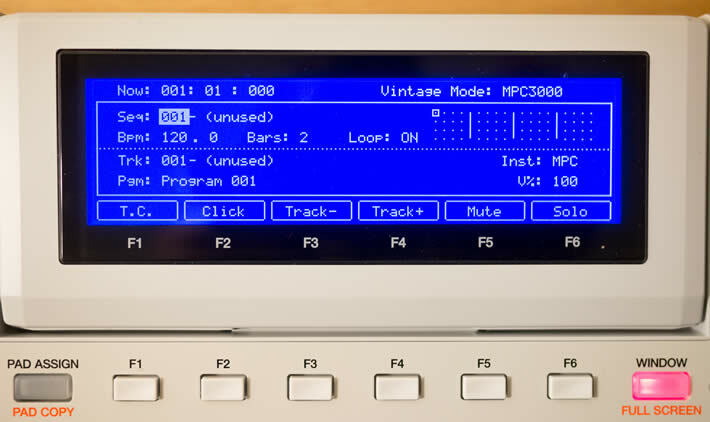 Perhaps you are not aware of why those ports are there, or that two input , four output midi is lavish for any device, usb midi….old school midi or otherwise…..but to properly ascertain its potential, you must test out how it works with other sequencers, and synthesizers *outside* its host computer. Until then this review is just incomplete and is ignorant of the history of midi and music production computers in general. Can this provide adequate sync to another sequencer? Hi there, thanks for the feedback, but this is a review about build quality of the hardware and general hardware specification of the machine, it’s not meant to be a fully exhaustive review of MIDI capabilities with other devices. That is ultimately a software issue, limited by the features available in the current version of the MPC Software. I am working on a software review, so will mention MIDI syncing capabilities in that. But regardless, of course the MPC Renaissance can communicate with hardware MIDI devices (currently at 1.31, sync is limited to the MPC Ren being the master).